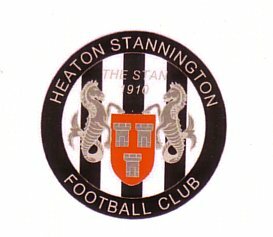 After Saturday’s fantastic win over Billingham Synthonia, the Stan Army were hopeful that the team had shaken off their poor home form and were looking forward to cup success. There was only 1 change from Saturday as the Stan took on a much-changed Terriers team from the one they beat 3-1 in the league in August. The Terriers shot straight at Smith in the 1st minute and 2 minutes later a ball into the box saw a great header by Johnson but the keeper got his hands to it. The Stan had another headed effort after 7 minutes and 2 minutes later an attack by the visitors was eventually cleared. A hard but fair 50/50 tackle by Johnson led to some handbags and although Lee managed to keep out of the fray he was booked for his tackle. The Stan put the ball in the Terriers net in the 13th minute but it was offside. Robinson was then flagged for offside when he wasn’t. He sped past the defence again and a defender fell in the box, taking Dan with him, but no penalty was given. In the 18th minute, Robinson started to accelerate past the defence again but his hamstring went which was a huge blow for the Stan. The Terriers had a rare attack, followed by moves by Yates and Deagle, before the visitors shot high over the bar in 28 minutes. Soon after, a ball into the Terrier’s box hit off Yates’s head but was cleared by the keeper. Jones was then brought down just outside box and although Deagle’s free kick went round the wall, the keeper caught it. The Terriers then had 4 chances but Smith did well and for the 3rd there was a great clearing tackle. In the 36th minute, the Stan had a prolonged attack involving 2 corners with Jones eventually shooting wide. Smith was then under pressure again but made 2 saves before Stoddart made a good clearance. Blackett then counter attacked but shot wide under pressure. Errington made a good clearance before Smith caught ball from a corner. The visitor’s had been on top near the end of the 1st half, and this continued in the 1st minute of the 2nd half when Christopher Armstrong powerfully headed a corner ball into the net. It was the 3rd time in 4 matches that the Stan had let in a headed goal from a corner. In the 50th minute, a Terrier forward made an overhead kick in the Stan box which was headed over by a team-mate. 2 minutes later the Stan had a corner and then a free kick which was shot wide. There was then a quiet 10 minute spell and the Stan lacked bite after losing Robinson. His 20th minute replacement Blackett himself got injured and had to be replaced by Walker. The lack of attacking options was evident when over a space of 4 minutes, 3 Stan balls into the box saw no one being there for them. The Stan were punished for this in 67 minutes when Lee Scott in the box connected with a ball in from the right to make it 2-0 to the Terriers. A minute later and again a Stan ball into the box saw no one there followed by a Deagle shot that was easily caught. The last 15 minutes saw most of the possession and efforts belonging to an increasingly tired home team but with no end results. Wear headed wide from one of many corners after 77 minutes while Deagle shot wide and Jones had an effort cleared. Just before the final whistle, an Imray shot hit Yates and Johnson’s rebound effort saw a great save by Wells. So the recent overall poor home form continued against an average but fitter Terriers side. The Stan Army have no cup runs to dream about until next season as the club now focuses on the promotion battle. Smith; Stoddart; Williams; Wear; Errington; Imray; Jones; Johnson (Y); Robinson (Blackett (Walker)); Yates; Deagle. Unused sub: O’Brien.